PDF Bookmarks can be quite a lifesaver. They help us save time by jumping to specific pages in a PDF without going through the trouble of scrolling or even searching the text. Unfortunately, most PDFs available on the internet, perhaps with the exception of most published books, don't usually include bookmarks. To compound matters, when we make our own PDFs, whether from scanned documents or virtual PDF Printers, it's rather hard to come by a free software that will allow you to add bookmarks to these PDFs. Well that's until now. Tracker Software have recently made their previously pro feature of adding, editing and moving bookmarks completely free in their PDF-Xchange Editor. Previously you had to buy a license to access that feature. This is some very good news I thought I should share to those trying to find a free and intuitive program to do this task. Here's how to do it. 1. Get PDF-Xchange PDF Editor from the official page here and install it. The software is essentially a PDF Viewer with basic and advance editing features included, certainly a better alternative to Adobe Acrobat. It's also completely free though some of the advance editing features are restricted to license holders. Unfortunately, it's only available for the Windows platform. You can hide the restricted features from the UI by going to Preferences (Ctrl+K) then Registration. 2. 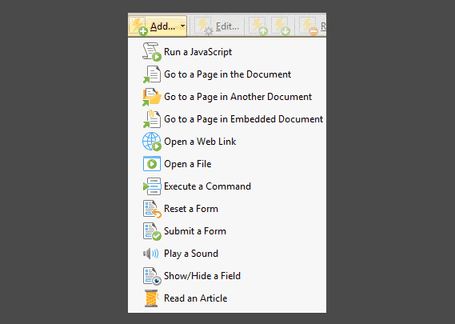 Launch the PDF Editor and from the File menu open the PDF you wish to add or edit the bookmarks. 1. Toggle the Bookmark Pane by clicking the bookmark icon in the Home tab. You can also just press the key combination Ctrl+B to reveal it. 2. Now on the opened PDF, move to the page you want to add a bookmark and click on the add bookmark icon at the top of the bookmark pane. You don't have to toggle the bookmark pane first to add a bookmark. Instead, you can at any time add a bookmark by just right-clicking inside an opened PDF and selecting Add Bookmark from the context menu or using the key combination Ctrl+Shift+B. 4. When you’re done, don’t forget to click on the Save button (or Ctrl+S) to apply the changes to the PDF. 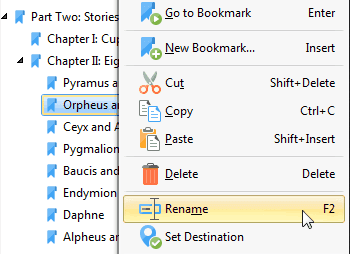 You can edit exiting bookmarks in the PDF by renaming, deleting or changing their text properties. You can also edit the default action when a bookmark is selected as well as the bookmark's apperance properties. 1. To rename a bookmark, select it and press F2 (or right-click and from the context menu select Rename). 2. 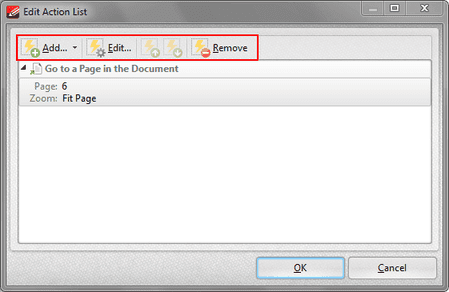 To delete a bookmark, select it and press Delete key (or right-click and from the context menu select Delete). You can also use the bin icon at the top of the pane. You can delete multiple bookmarks at once by selecting them by dragging your mouse over them or by selecting the top most bookmark, then while holding Shift key down selecting the last bookmark. To delete all the bookmarks available, select all of them using Ctrl+A then press the Delete key. 3. You can change the properties of the bookmark text by bolding, italicizing or changing their color. To do this, right-click on one or multiple selected bookmarks and select Properties. That will open a Bookmark Properties pane on the right side where you can change these properties. 4. Typically when we add a bookmark we want it to take us to a given page in the PDF. However, it's possible to give it other actions other than this, for example opening a web link, running a java script or even opening a page in another PDF. We can also have it do multiple actions simultaneously, such as move to a page and open a web link. To change or add an action(s) to a bookmark, right-click on the bookmark and select Properties. 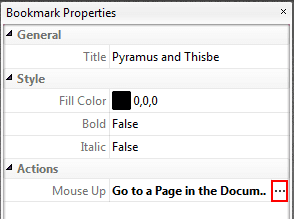 Next, inside the Bookmark Properties pane, under Actions select the three dots at the end. That will open a window with the current Action. You can Edit or Remove the current action using the icons at the top. Editing won't allow you to change the current Action, just the properties of the current action. For instance, for a jump to page bookmark you can edit the page it jumps to and the zoom level it will use by default. To add a new action, click on the Add icon at the top and from the menu select a new Action. PDF-Xchange offers plenty of actions to choose from as shown in the screenshot below. Adding the action is pretty straightforward so I won't be going over that. As always, when you're done don't forget to Save your changes. Sometimes an existing bookmark may jump to the wrong page in the PDF. To change this, we can move the bookmark to the correct page. 1. Toggle the Bookmark Pane and select the bookmark you wish to move. 2. Now move your PDF to the correct position/page that you'd wish to move the bookmark to. 3. Right-click on the bookmark and in the context select the Set Destination option. 4. Save the PDF to apply the changes. There's also an option to export and import bookmarks from and into PDFs. This way you can for instance export bookmarks from one PDF and export them to another PDF that did not have said bookmarks. You can access this option by right-clicking inside the Bookmark Pane. For more advanced bookmark features such as creating bookmarks from Table of Contents, building Table of contents from the bookmarks or creating bookmarks from the Page Text, you'll need to get a license to access these and more features. For basic bookmarking tasks however, this should meet if not exceed most needs.